If you want to know my opinion of this book, you need merely to look at my copy of it. I bent the pages down at the corner to remind me of the places in the book where I wanted to dissect Miller's personal opinion of the "Christian" walk (his quote marks, really . . . not mine). You'll also find my copy of the book in the recycle bin after I'm done with this review. (It'd be in the trash but I'm trying to do something nice for the environment.) While I'm typing this review, I'm using the book as a coaster for my sweating water glass. I never intentionally mark up books with pens or crease marks. But this one is pretty marred. I also realize that a great many people will not understand my opinion. I will try to make it as clear as I possibly can. Yes, I do realize this is his personal opinion and "nonreligious thoughts on Christian spirituality." It is not gospel truth. He didn't even try to argue that it was. If he had been trying to argue that, I assume he would have used scriptures to back up his thoughts and arguments. Since scriptures are nowhere to be found within these pages, I can conclude that this is merely his opinion and that I simply do not agree with it. I'd also like to state that I'm going to use the term "Christian" to define a follower of Jesus Christ, the one true Son of God, in this post. As Miller suggests, he'd like to ditch that term because if you ask 10 people on the street how they would define "Christian" you'd get 10 different answers. Well, now you know my definition (for purposes of this post) and further translation should be easy. I primarily dislike this book because from all I've heard about it in person and from most of everything I've seen online, it is being heralded as a fresh new approach to Christianity and is sparking a revolution, of sorts, within the church. (In fact, I heard so much about this book that I chalked it up to being the next Purpose Driven Life and thus waited until this last week to finally read BLJ. It struck me as a fad book.) Unfortunately, I think it is a fad book and a destructive one at that. Granted, this is Miller's own opinion of the world and, I remind you, he did not back up his thoughts with scripture or even try to defend them. He merely stated who he was and how he thought. The problem is that his "diary" was published and people latched on to it and indentified with it. But when you indentify with something you typically start to change behaviors/thoughts/feelings to engage with the familiar. Which is a problem when someone's thoughts are a bit screwy and not exactly on target. Suddenly their emotions are driving yours but there's no clearly defined path to explain where either of you are going. Compare that to the verse above. Miller states here that he knows something is right or wrong based on his experience. Life experience? Spiritual experience? Relationship experience? The way he has always brushed his teeth experience? 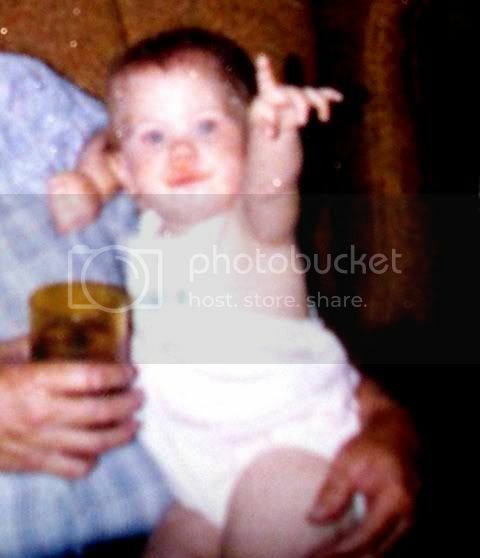 I really don't know. But I do know what he said (i.e., his experience tells him so). I find this frightening in life of the fact that we are told that we cannot trust our own understanding and should not trust our own understanding. However, if we put our trust and understanding in God, He will direct our paths and lead us in the ways of wisdom and perfect understanding. (Forgive my overuse of the word "understanding.") Somehow God's ability to understand and impart wisdom seems more solid than Miller's. But that's just my opinion. Quite frankly I almost stopped reading this book so many times. However, Miller's writing style is intriguingly different than most, plus I had hopes that he was going to conclude his life's wanderings into some solid truths. Which, btw, never happened. I wouldn't want you to suffer through this book waiting for conclusion. You'll just be frusterated. God didn't seperate us and make us holy so that we could dribble out dirt like our counterparts. Everything we do should be done to and for His glory - including the way that we speak. To try and belittle those who are offended by foul mouths and put down those whose ears are offended by offendable words displays an attitude of immaturity. Miller is essentially saying, "It's too hard for me to try to remember not to use the F-word. This is just who I am and you guys in the ironed, neat clothes need to just learn to accept this. I do and it makes it easier for me to identify with the lowly." For the record, I don't think we should intentionally go about trying to identify with sin. I really shouldn't have to defend that statement and I think I shall refuse to. It's a pretty basic idea. Do I think it is important to communicate the gospel to the unsaved? Yes. Not only do I think it is important, I think Jesus commanded it of us. But it's not a pretty gospel that should be made more attractive so that people can "accept it." Jesus clearly stated (John 14:6) that He is the way, the truth and the life and that we cannot come to the Father except through Him. And do you know what we have to walk through in order to get to the Father? A bloody mess. It's not attractive, really, if you stop and think about it. It involves the most perverse sin and the hardest of hearts. But God gives the grace to get through it. He grants life and life everlasting. That's what makes it AMAZING and makes a person willing to walk into the fire. If any person is relying on the way that they feel to establish a future and a hope, they are lost. Just like if you relied on your ability to feel great love for your spouse every single second of every single day for every single year of your marriage, that your marriage will be able to stand the strains you are forcing on it. and take only the ways that are firm. keep your foot from evil." God can handle the heavy work; He can take on the tough cases. We don't need to worry about feelings fading in or fading out. Our responsibility is to look unto Jesus, the author and perfector of our faith (Hebrews 12:2). He will keep us on the straight paths. He will lead us to the way everlasting. He will give us a future and a hope whether our feelings dictate that we're in the clear or not. He makes us sure in Him. And thankfully -- Donald Miller's opinion really doesn't matter. Someone else recommended this book to me, but I haven't read it. It sounds like it really engaged you. And your review in turn sparks my thinking! You make a lot of good points. I think we all need a place to be honest about our questions and struggles, but to publish them isn't always the wisest or most loving choice. I agree with you there. We can end up being a stumbling block, having more influence than we realize. I agree with you partly but not totally on the "my experience tells me so" issue. Isn't our experience, and our ability to discern truth, part of what gets us to God in the first place? A person isn't going to trust God before being convinced that he's real, and experience is the only thing we have to go by to get there. This verse pops to mind, too: "We love him because he first loved us." Receiving love is the precursor to a relationship with God, and that's an experiential thing, isn't it? Just some questions you get me thinking about. This is a great review that really wrestles with the book. Thanks! I read this book 3-4 years ago--a the time I thought he had some interesting things to say, but then found that I quickly forget them (often when a book really grabs me I think about it for a few weeks if not months or years). You have good insights into his not wanting to get married. I heard Miller speak 2 years ago and then read Through Painted Deserts, but I don't think you'd like it either and I thought wasn't overly impressed with it (it was his first book that got published after him having a "hit.") Books are somethings like pancakes (and some say kids), you throw your first attempt away. I read this book a few years ago and also the 2nd, Searching for God Knows What. I enjoyed them, actually; the first one more than the latter. Reading books like this helps me reflect on and evaluate my own spiritual journey, even if/when I don't agree with all the author says. And since it did that for you, perhaps the book was successful, just not in the way you might have expected. :) This is one of my favorite books of all times. So are lots of Donald Miller books. I really enjoy books that make me THINK, and this book did that. It made me evaluate why I believe the things I do...is it because it's what I've always been told is true or it is really true? If you're going to throw your copy out, I'd love to have it. Shoot me a message at jennalayn1@yahoo.com if you'd be willing to send it to me. I'll jump in and say that I agreed with carrie and mercy's maid about the way that this book made me think. I don't always want a book that hands me a bunch of safely dry comments supported by Bible verses. Sometimes, a very thoughtful book - that leans a little toward the hokey side, perhaps - can be just as, if not more, effective. That's how I felt about Blue Like Jazz. I totally agree with you Carrie. The Christian faith is based on the Bible, not the individual's experience. We have the Holy Spirit who helps us with discernment but our faith and what we believe about God must come first and foremost from Scripture, not life experience. I appreciate your honest review. I really appreciated and enjoyed your thoughtful and careful review. This book has been recommended to me in the past, and several of my children read it and said they thought it was awful, but they didn't point out the main problem with the book as you did: Scripture/truth vs. feelings. I am persuaded NOT to read this book, and I thank you! Hi, Carrie! It's always great to discover new book blogs ~ thanks for taking the time to share your reviews. I wanted to weigh in on the question of faith and experience. As Petunia put it, "The Christian faith is based on the Bible, not on the individual’s experience." It has been several years since I ready BLJ, so I do not remember the particular context of the "experience" quote you mentioned (I am quite a book-marker-upper, however, so when I get home I may have to look up my margin notes). I have read all of Miller's books and heard him speak a few times. From my encounters with his writing and speaking, I can say that I know Donald Miller highly values the truths captured in scripture, as do I.
I do not, however, believe that valuing scripture requires renunciation of experience. I love the Gospel of John. I love how it starts out reminding us how precious it is that the Word of God made his dwelling among us so that we could experience him, walk with him, follow him... and finally understand his truth. The disciples experienced Jesus, that is how they learned about the truth, the life and the way. In fact, in John 5:39-40, Jesus pleaded: "You diligently study the Scriptures because you think that by them you possess eternal life. These are the Scriptures that testify about me, yet you refuse to come to me to have life." The Bible is amazing, and I am astounded at how every time I encounter the Word of God contained within I learn something new and understand more and am convicted about different things. The Bible is amazing, but it is not what Christianity is about. The Christian faith is about experiencing the love of Christ, about loving the Lord God, and about learning to love others with his love. The Bible is a special gift, the recorded experiences of people with God over time, of time spent with the savior while he walked the earth, of the indwelling of his Spirit, and of the birth and growth of the Church. The Bible is amazing... but the Bible is a record of experiences. Thanks everyone for your commments! In other words, I should not know that something "is so"/is truth because my "experience tells me so." Emotions, experiences, thoughts, etc., must all be VALIDATED by scripture. I agree with Kimberly in saying that the Bible is a compilation of experiences that people had with Christ. Perfectly unusual experiences in some case. But it is primarily a communication of Who God is, exactly, and how we should test our experiences by the Spirit of truth. Does this make sense? In other words, I am not saying that experiences are useless or shoudl be ignored. I AM saying that we should not make statements that, "I know it's true because my experience says so" with*out* that important scriptural validation. For our experiences can lead us to think untrue/sometimes manipulated thoughts. If I let my experiences stand alone, then I'm in trouble and so is everyone who would think to listen to me for two seconds. However, if I can say, "I experienced *this* and I can give you an example from scripture that would suggest (or outright state) that I have concluded truth" then that is one thing and I have no objection to offer. Jesus sent the Holy Spirit to lead and guide us in our lives. If we are not daily EXPERIENCING His presence, then something is desperately missing. I experience things; you experience things; Donald Miller experiences things. But I would never say (and take issue with those who would) that my experiences in life tell me whether something is true or is not true. There is one pure and undefiled source of truth and my experiences didn't make that list. amazing post (and comments) -- definitely needs a re-read to capture the depth and wrap my mind around what everyone is saying... hard to accept taking the words in the Bible as any type of truth without "experience" though -- how else to validate they are more then mere words? Carrie, your review was very accurate and insightful. Thank you for taking the time to read it so closely (despite your dislike) and dissect the good and the, well, less that good. I confess to some surprise when I hear people list Blue Like Jazz as a book that significantly challenged and/or inspired them, or list it as a breath-of-fresh-air. I would list this book as "nice", and I mean that in an "it's ok, but I'm not planning on reading the author's other books" way. This is a nice book. I'm surprised because there are many, many truly spirit filled and deeply grounded just phenomenal writings already in existence... I won't read the author's other books, not because I disliked this one, but because I want to move along to much, much better ones. So I guess I'm saying, if you thought this was good? What else are you reading that your standards (and I'm sorry for being so harsh) are this low? BLJ and Miller's other words are simply doing good things for many people (not the least of which is sparking conversation, among those both familiar and unfamiliar with Christ). That is a high honor for any sort of literature, and I can only hope do the same in my own life through speech and deeds, although I expect nothing less than for a a critic somewhere to find fault with it. I haven't read the book in a while and I've read all his other books (and many others) since. I will try to salvage what I can from my brain. It was difficult for me to parse through your review, mostly because I think the impressions we got were completely different. My impression of your impression is that Miller was trying to paint himself as "different" and that we need to be more accepting even if it conflicts with the Bible. It also seems that you are saying we just need to follow the Bible (and we do). I don't think that Miller was trying to paint himself as different, I think he was trying to say that the church has failed on a number of fronts and that a better one is possible. This seems irrefutable and dignified. I can say I agree and believe the absence of a Christ-centered message in [insert significant percentage] of churches is a tragedy. Unimaginable numbers are driven away from the love of Christ due to fear-based messages and political alignments run amuck (amongst other issues). This is not to say that church is an abject failure. Far from it. And I don't believe Miller is saying so. I think he's saying somewhere along the line subtle shifts took place that seem different than the message Christ communicated. We (Christians) decided we like *these* people and not *those* people. I don't think this book is for Christians who feel like "outcasts." I think it speaks to people who've had poor experiences with the church or those associated with it. There are millions of them. If they are to be won over by Christ in us, it is in our best interest to let that love shine through instead of acting as if we are the gatekeepers to Christ's love. And that, is my most basic impression of this review. We can't throw Bibles at people and tell them to figure it out and we certainly can't preach *at* them all the time. We need to be in the game with them and loving them first and foremost, not separate and aligned. We need to be telling them they are beloved children of God and not sorting out all their faults and sins and where they need to improve. We need to have room for everybody (!!!) and not act as though we know how it all works and it's a recipe to follow. Miller's not trying to tell anybody how anything works (!) or somehow lead them away from Christ by putting his opinion in place of the Bible. Your review furthers the point of the book to its core. "I don't like your opinion and it doesn't really matter." What does those thoughts say about our judgment? Our self-righteousness? We Read to Know We Are Not Alone..doesn’t that imply that a reason readers read is to identify with the writer or characters of the story. Maybe Miller wrote to know that he wasn’t alone. Either way you criticize the notion of anyone identyfing with Miller. It seems quite a contradiction if you're saying I read know I'm not alone...I read to identify with others, but only others that I agree with or only others that aren't screwy. I think Miller would agree with you that he was just writing his thoughts or “diary”. It’s not often when I journal that I quote scripture to back up my doubts or thoughts regarding God. Like any other memoir it’s going to be one person’s opinion…it isn’t a theological text. It seems like you’re judging this book relevant to a genre that you acknowledge it isn't part of. which after all is the point, isn't it? "Which is a problem when someone's thoughts are a bit screwy and not exactly on target." Everyone's thoughts are a bit screwy and not exactly on target. Unless it's the actual Bible, of course it's going to be off target. At least it adds to the conversation. Miller's books have at least gotten some people thinking about God, who previously rejected God. I think it's interesting that the 'Shopoholic' series, to you, is merely not worth your time, while BLJ is downright "dangerous." Well if you are interested in pointing out irony you could say that my blog is a personal opinion (which it is) and you are attacking me -- which is what you say I shouldn't be doing to Miller. Ironically enough. It really is a vicious circle and not a subject I'm going to address. Shopaholic really ISN"T worth my time. It's not trying to present scripture in anyway and is just bad subject matter. Why waste time on it when there are plenty more works of fiction which are more worthy of consideration. BLJ IS dangerous because it is presented by most people who read it (read my entire post and disclaimer and you'll see I've already said this) as some kind of doctrinal guide. It's true. They even created study guides to be used in church settings. Journals do not usually receive that much notoriety and certainly not as "something to be studied and applied to our individual lives." THAT is what makes it dangerous. Perhaps Miller did not make it so, but certainly his readers did. To be honest with you, I think you are missing the point(s) Mr. Miller was making entirely. Being followers of Christ we are called to relationship with God, and with people. People are relational, and that is a fact. Reaching people for the Kingdom by simply telling them scripture, or directing them to the Bible, while in some cases effective is hardly carrying out the great commission by anyone's standards. We are called to Love others as we love ourselves. Speaking truth is fine, but we are to speak truth in love. Tolerating someone, accepting someone as a fellow human being is not love. Love is treating them as if they were more important than you. Their needs, desires, concerns, fears, hopes, should all be important to you on a relational level. Now don't get me wrong I doubt many of us have the capacity to relate to everyone like this, but in any event it is what we are commanded to do. I feel like you are so personally offended by people who claim to be different, I sense you have your own little Christian comfort zone, and you most likely prefer the beautiful people over the prostitutes, the criminals, the homosexuals and so on. I guess that's fine, after all who am I to judge? People are people. There are those who are lost and those who are saved. People respond to emotions, to relationship. Hand a Bible or a pamphlet with scripture to a non believer scorned by bad experiences with the " church " and see how effective plain truth is. Sure Truth is Truth, but Jesus told us to spread the Gospel (the good news) and to do the things He did. He didn't walk the earth just dropping random truth on folks, He spoke into there hearts, their issues, there sin, and He did it in a way that was loving, and relational. He gave people back their dignity, a sense of value and purpose just by sharing a meal with them or going to their home etc... In that culture those acts were very significant social behaviors that meant something. I'm sure many Christians today feel more than satisfied to invite someone to their church or to a Bible study, but where is the investment on your part? Where is the risk of pouring yourself into another human being's life in a personal relationship in an effort to show them the truth rather than tell them the truth. Walk into a bar and drop the name Jesus a few times or quote some scripture and see what kind of response you get. People are build to need relationship. It is through relationship and love that fear is overcome, strongholds pulled down and truth accepted. If you truly follow Christ, and have love in your heart, then you know that people are more important than opinions. God's Truth is Truth period, and it stands on it's own without the need of any of us to make it function. However, the Bible is not a collection of truths to be used as labels to point out sin to others. We are not called to judge nor is it our purpose to determine who is committing what sin. We are called simply to love God, and to love others as we love ourselves. In closing I'd like to point out that Miller did not to my knowledge ever use his personal feeling or thoughts as Christian theology. He was simply telling his story, how he got from point A to point B, what he was thinking how he felt and so on. I think maybe your confused and think that as a Christian it is your duty to defend the gospel of Truth and some how validate it. The thing is, Truth (God) validates us, we don't validate Him. I don't get it right every time, none of us do. Grace is after all the reason why life isn't fair. After reading BLJ by Don Miller I'm reminded of Romans 7:15 "For I do not understand my own actions. For I do not do what I want, but I do the very thing I hate." Miller clearly identifies with the Apostle Paul's struggle to live without sin in a sinful world. But I don't put much stock in Miller's liberal critique of the American church as the answer. I agree with Carrie that BLJ should not be interpreted as a doctrinal guide. BLJ is simply one person's journal of their spiritual struggles and conversations about God. A. I love you. And that's why I'm stalking you again. C. I am not actually going to re-read this because enough people I've trust have hated it, but honestly I don't remember hating it very much. I kind of remember liking it. My words were "well, it's ok...it's a little bit...'Portland' if you know what I mean." D. Your "I'm so different and unique" rant had me in STITCHES. I HATE when people do this. One of my personal peeves actually. This book is a good way to start spiritual conversations with friends. This book could be use to evangelize to our non-believer friends and share the Gospel to them. It is a good source people seeking for answers and truth. 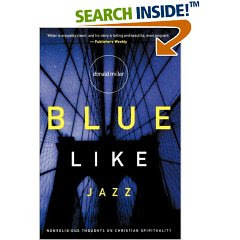 We have included Don Miller's book Blue Like Jazz as one of the tools we could give to our non-believing friends to come to Jesus. You can check the site at http://booksforevangelism.org. Heaps of great books can be found in the site which can be helpful for you and your readers.